BALLYNAHINCH — Ballynahinch motorcycle dealer Denis McBride has sparked off a new project to help reduce the number of motorcycling accidents. The former motocross ace has offered his expertise to teach young riders basic biking skills. “Motorcycling is getting bigger every year,” Mr McBride said. It’s important we give riders some idea how to handle their machines. 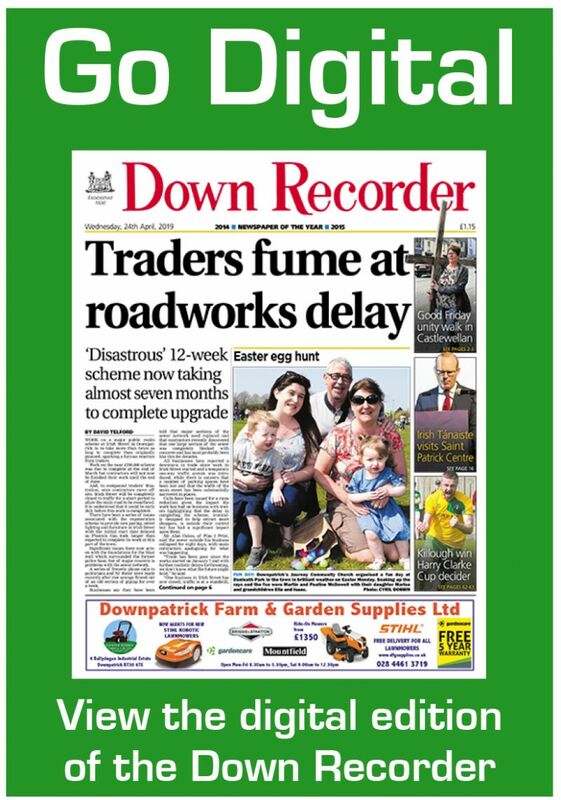 “I’ve had teachers from schools in Newcastle and Ballynahinch ands members of local road safety committees all expressing interest in the idea,” he told the Recorder this week. Mr McBride’s concern comes with a rising number of motorcycle accidents in the province. In the Ballynahinch area alone there have been several serious accidents this year. Among the proposals he has suggested to augment his own coaching course is specially built ‘trail parks’ and an elementary riding test before anyone is allowed to buy a machine. “People must know how to ride their machines safely,” he said. Balance and technique are important. NEWCASTLE — Newcastle Round Table’s attempt to raise over £2,000 for the Dr Barnardo’s children’s charity got underway this week. Four members, Billy Ogle, Felton Williamson, Sam Harrison and Joe Toland were flagged off from the Slieve Donard Hotel to start their marathon visitation around Ireland. Every Round Table in Ireland will be visited and a competition has been organised to guess the number of miles the journey will take. Each Round Table has received tickets on which you can guess the mileage on the car when the journey ends. Fifty pence is the price per guess and the winner will receive £100. In this way, the Round Table hope to raise in excess of £2,000 for their selected charity. The drivers will be collecting the ticket stubs from each Round Table as they visits the towns. The drive began on Tuesday at 12 noon and with a bit of luck and safe driving the boys should be at their last port of call in Wexford on Friday. The winning ticket will be announced at lunch on Sunday. DOWNPATRICK — Window-smashing, ransacking vandals left their trademark on yet another school last week when they broke into St Patrick’s Boys’ Primary School in Downpatrick. The St Dillon’s Avenue school was badly vandalised with the tuck shop destroyed, windows and door panels smashed and various types of equipment wrecked. The latest incident happened last Wednesday night and came less than a week after police had been allied to see the extent of the damage caused by vandals at the nearby St Mary’s Secondary School on the Ardglass Road. On that occasion pictures and statues were knocked off walls and broken and several other items, including doors, were badly damaged. Last Wednesday night’s attack on St Patrick’s Primary School has been equally disturbing to police, who feel that a new wave of criminology seems to be underway. This time they witnessed the destruction of the school’s tuck shop which had just been stocked up with almost £100 worth of stock. Everything was scattered round the hall and even on to the adjoining football field. Fire extinguishers were turned on and directed at tape recorders, which were destroyed. Police are treating the crime seriously and have appealed to for any information to help them in their inquiries. Fingerprints have been taken. This latest wave of school destruction is already being regarded as monstrous in terms of the community. No-one, it seems, saw anything, but this could be indicative of the public turning their back, lest they should suffer recriminations. Brother Otteran, headmaster at St Patrick’s, was abhorred at the destruction. He permitted a Down Recorder photographer to visit the scene and had no objections to the crime being publicised. HOLLYWOOD — The widely-held belief that Hollywood actress Greer Garson was born and bred in Down District has been scotched. Now celebrating her 70th birthday, Miss Garson says her strongest family connections are with Scotland. Despite this, Miss Garson’s ties with Co Down are strong. Her mother, Nina Greer, was from Downpatrick, and she also spent much of her childhood in Castlewellan where her father died shortly after she was born. Miss Garson, who will always be remembered for her performances in classic films like Goodbye Mr Chips, which she made in 1939, won an Academy Award for Mrs Miniver in 1942. CROSSGAR — Talented Crossgar soprano Rosemary McKillen took a major award for the second successive year at the recent Waterford International Festival of Light Opera. Her outstanding performance as Arline in Belfast Operatic Company’s production of The Bohewian Girl earned her the trophy for the best Irish singer and led the adjudicator to comment “a beautiful voice — an excellent performance.” Last year Rosemary won the award for best female singer as Giannetta in The Gondoliers. After her return from Waterford Rosemary appeared last week in Studio Opera Group’s acclaimed production of Benjamin Britten’s Turn of the Screw in the Arts Theatre, Belfast. Her next appearance will be with the Queen’s University Operatic Society in Menoth’s Amelia Goes to the Ball. SEAFORDE — A £113,000 scheme to provide nine new homes in Seaforde has been approved by the Housing Executive. Work is expected to start in January on a site on the Dromara Road. The development will comprise four three-bedroomed houses and five two-bedroomed bungalows. An Executive spokesman said that the site would be behind a row of terraced houses owned by the National Trust. KILLOUGH — Plans for a new caravan park in Killough have been dealt a final death blow by the Planning Appeals Commission. In a ruling this month the Commissioners rejected an application for a small caravan site in the village on the grounds that planning policy for this type of development had not been made clear. However, the case could bring an important breakthrough for potential developers, with an instruction to local planners to clarify their policy on caravan sites in the area. BALLYGOWAN — Mrs Joy McVeigh, of New Line, Ballynahinch, is officially a ‘super cook’ after finishing runner-up in the national final of the Cook of the Realm competition which was televised last Wednesday. Under the hot television lights Joy battled for a total of £9,500 worth of prizes in the competition sponsored by Woman’s Realm magazine and the National Dairy Council. Joy, who is a teacher at Comber Primary School and lists tennis, squash and antique collecting among her hobbies, was beaten by only two points with a delicious meal of creamed kidneys with bacon and mushrooms. PORTAFERRY — Pressure is mounting to halt there bulldozers moving in to demolish an old church which workmen stumbled on last month in Portaferry. The old Methodist Church is situated behind Meeting House Street and it was discovered recently when Department of the Environment workmen were demolishing warehouses nearby. Although the building is in very bad condition at the moment, residents are anxious to preserve it for its architectural and historical importance. However, planners have earmarked the site for the building of a new car park.